To assess Hurricane Maria's massive power and destructiveness when that category five storm slammed into Dominica on 18 September 2017, take a look at DOMLEC, the only company on the island that generates and distributes electricity. Maria did not only violently rip out the power lines of almost everyone in Dominica and kept electricity off for days, weeks and months, it also dimmed DOMLEC's profits by nearly 20 percent. Moreover, it will cost the company tens of millions of dollars to repair the damage. "The 2017 financial statements indicate that sales decreased by 21.9% over sales in 2016. Gross revenue fell by 18.4%," wrote Chairman David McGregor in his report to shareholders in the DOMLEC 2017 Annual Report. "Juxtaposed with a net profit figure of $12.87 Million in 2016, the Company suffered a net loss after tax of $9.35 Million as a result of Hurricane Maria's passage". In addition, McGregor said the cost of restoring DOMLEC's services was estimated at EC$ 31,799,028 (US$ 11,704,158). 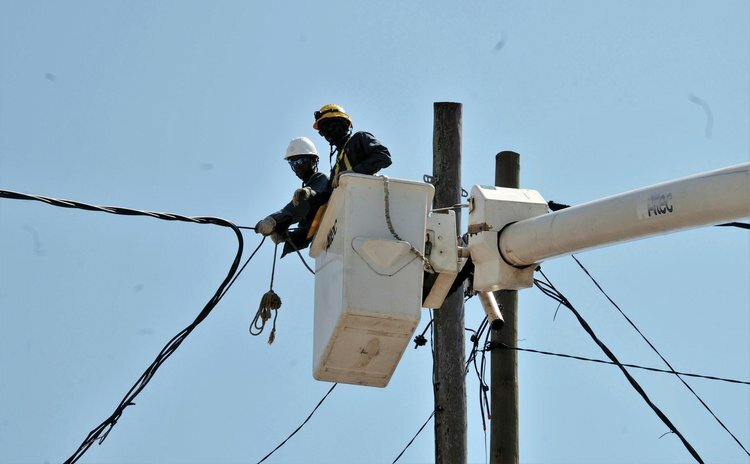 "Financing for the restoration was made possible through the previously arranged standby facility of EC$30 Million with the National Bank of Dominica (NBD). Additional financing includes an EC$43.5 Million loan and a grant of EC$.5Million which has been approved by the Caribbean Development Bank (COB) to fund the restoration, an organizational review and a Climate Vulnerability and Risk Assessment (CVRA)," the chairman said in the report. To date, according to the report, "79% of customers, whose installations were technically ready have been reconnected. 74% of the T&D system is back online. Generation availability is 19.73MW or 72% of installed capacity. Peak load is 8.82MW or 48.9% of pre Maria peak". In his report McGregor gives a detailed account of Maria's destruction of DOMLEC. "While 100% of the Transmission and Distribution (T&D) network was compromised, 85% was severely affected", the report stated. "All 36,499 customers were left without power. The impact on the generating system and assets was significant. All support systems including information systems, commercial, financial and human resource processes were also affected". With help from Caribbean friends, DOMLEC said it overcame many challenges in the restoration process including bad weather, insufficient manpower and equipment, shipping problems as well as traffic issues. In keeping with the concept of "building back better" DOMLEC said it is implementing a plan that is based on climate resilient and sustainability. "Elements which take into consideration climate resilience have been introduced into the restoration process. Examples of these are utilizing a new class of poles and construction of structures to withstand category 5 hurricane winds."